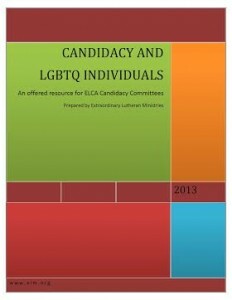 ELM is honored and excited to release the final version of “Candidacy and LGBTQ Individuals.” This one-of-a-kind resource was created for ELCA candidacy committees working with LGBTQ candidates. You are encourage to share this widely! We released a draft version earlier this year in order to receive feedback and we are grateful for the suggestions and comments you made. The document is stronger because of this communal effort. This resource is timely in Advent, a season when we become more keenly aware of the now and not yet of so many things. Now, more and more gifted and called LGBTQ people are attending seminary and serving as rostered leaders. This is cause for joy and a celebration of these unique gifts in our church. And, at the same time, some gifted and called LGBTQ people continue to face barriers in seminary, candidacy and the call process and are told “not yet.” We hope this offered resource will serve to honor the now and not yet as we both recognize the reality of barriers AND celebrate with joy the gifts of our LGBTQ leaders. We are thankful to the ELCA for their support of this project and for all the faithful ones who contributed to this gift. And thanks be to God who was, who is, and who is to come. This entry was posted on Tuesday, December 10th, 2013 at 2:24 pm	and is filed under Blog. You can follow any responses to this entry through the RSS 2.0 feed. Both comments and pings are currently closed.